With over 15 years of experience, our team is prepared for anything you send our way. What's the point of having a website if nobody is looking at it? That's where we come in. We pride ourselves on helping smaller businesses compete in larger markets. Our approach will be unique to your industry, company and demographic. We offer SEO friendly, mobile responsive, professional design, secure websites for our clients. 1st month hosting FREE. The next step after a website launch. We manage everything from Pay-Per-Click to Social Media Marketing. Increase engagement with your potential customers. Increase the value of your company by giving it a digital face lift. How about new, modern brochures, flyers, or business cards. Need designs for online ads? We've got you. Express your companies message through video! Whether it's a commercial, web series, video testimonials or internal training we can help your vision! UpTree prides itself on being a multi-disciplinary marketing group. The services we offer are all top industry quality. Our teams are up-to-date on the latest practices and techniques for all services we offer. We guarantee quick turn around, SEO friendly and responsive websites at competitive pricing. Websites are marketing tools that your company uses to increase sales and every website we develop has that core principle. As we build your website, we keep the bigger picture in focus and ensure it has the capability to grow with your company. An important part of marketing is keeping your business looking fresh. Clean, professional looking design helps your company keep up with appearances and sets it apart from the others. Online advertisements, brochures, business cards, flyers or mailers- we do them all. 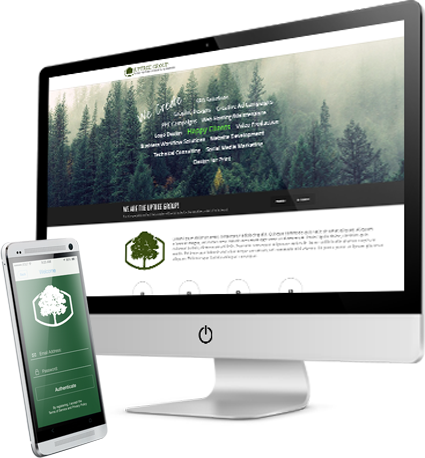 With UpTree, you can be assured that high quality design will be at your fingertips whenever the need arises. What's the point in a website if nobody is looking at it? Luckily, you're here with us and we'll make sure people look at your amazing website! We excel at this; Pay-Per-click, Social Media Marketing, E-mail campaigns, Viral Marketing, Search Engine Optimization- we use all the tricks in the bag. First, we get to know your company and then build a 100% custom, multi-level campaign. This is designed specifically for your business location, industry and targeted demographic. As we move forward, we analyze the data and modify the campaigns based on results. This is a constant ongoing process that you'll be a part of the whole way through. Commercials, web series, company in-service videos, corporate identity videos, and customer testimonials. These are some examples of what we can do for you with video production. Express your message in a clean, professional video that gives your company the edge it needs. All production is done using industry standard lights, cameras and audio recording equipment. This makes us ready to tackle any project you have with flying colors. The world is a mobile place now. With smart phones being in everyone's pocket, it's a great opportunity for your company to showcase itself via a mobile app. Or, maybe you have a great idea and need some help seeing it through. We offer great solutions at competitive pricing for app development. Carefully listening to our client’s needs and creating road maps to meet them. Utilizing bleeding edge practices to keep our clients on top and relevant. Keeping the bigger picture in mind throughout the whole process. No skipped beats. Delivering detailed reports to our clients. Full transparency. With the experience, skills and reputation to match, you can’t go wrong with UpTree. We will be your digital consultants and handle the boring (but extremely important) things so you can keep doing what you love. Running your business and keeping your customers happy. All quotes are free! Please add as much information as possible. 2018 UpTreeGroup.com - All rights reserved.